In areas where power outages are common, backup power sources are extremely important. Depending upon what loads you need to run and for what period of time, you may need an actual battery based system. We receive many inquiries about backup power options for the home or office in the case of a power outage. Often these questions come from people in hurricane-prone areas or wind-blown locations, where power could be out for an extended period of time. “Back up power” can mean different things to different people, so we'll try to explain some of the considerations when selecting components for your system. If you’re planning to install a solar electric (PV) system to offset your utility costs, you’ll use a system that feeds power back to your main utility power grid. When the power is out, however, your system will stop feeding power to the grid and, consequently, stop feeding power to your home as well. If you wish to connect to the utility grid and still be able to produce and use your own power in the case of an outage, you’ll need to add at least a few batteries and related components to your system. Below, we’ll help you understand the considerations of determining the amount of battery backup that’s right for your system. Powering a Refrigerator - for a short time only! If your electricity rarely goes out, but on the few occasions it does you would like to make sure to save the hundreds of dollars of food in your refrigerator, you may want to consider a small all-in-one back-up system. For about $300, a Xantrex Power Pack X1500 battery/inverter combo can provide power to a medium-sized (18 cubic feet) refrigerator for 2-4 hours before the battery needs to be recharged. That power pack can be recharged by plugging it into a wall outlet. If you have extended outages, you will need to charge the power pack’s battery by other means, such as a solar panel. You could use a small 12-Volt solar panel (ranging from $30-$350) to recharge the battery in the power pack. As an example, for a full charge, a 60-Watt solar panel would need full sunlight exposure for about 3-5 days. We strongly recommend completing a detailed Loads List. If you need to run multiple loads for several days while the power is out, you face a more costly solution and one that requires more analysis on your part. To size a large backup system, start by completing an examination of what you will be running: a Loads List. Don’t list everything in your house; just select the things you need to use during the outage. This will keep the costs down and can reduce system complexity. For example, you may choose to install a system that would provide power for your refrigerator, compact fluorescent light bulbs, a fan, and a small TV. 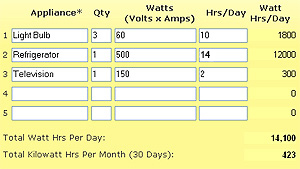 The loads list will help you tally the total you need in a typical day while the power is down. Next, determine the number of days you think you will be without sun to recharge the batteries. This is also called days of autonomy After a typical storm, the sun may come out full-force; in other cases, you may not be able to charge your batteries for a day or two. If you continue to draw power from your batteries without replenishing them, you will run out of power and worse — you could damage your batteries. Armed now with your total Watt-hours need and the desired number of days of autonomy, it is possible to calculate both the battery bank size and the number of solar panels necessary to recharge them. Check out our off-grid residential systems for ideas about the components you will need for the back-up system.